It’s intriguing that “First Of His Name” should arrive at the halfway point of Game Of Thrones’ fourth season, the year in which the show has received the loudest criticisms of its depictions of sexual violence. 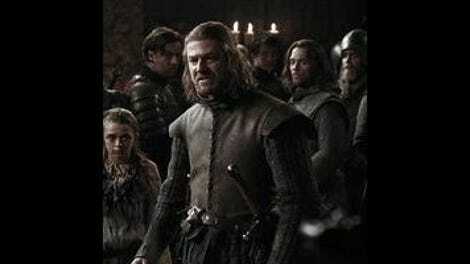 The episode is by no means a corrective for what occurred between Cersei and Jaime during “Breaker Of Chains.” It is, however, indication that showrunners David Benioff and D.B. Weiss (credited once more for the script) recognize their show’s degree of cruelty and how it’s disproportionately directed at its female characters. When Cersei and Oberyn engage in the exchange above, it’s not only an acknowledgement of what her brother has done to her, but also an acknowledgement that such trauma is a frighteningly common occurrence in this world. People like Oberyn are attempting to turn that tide, but change—as it is in our world—is a slow and frustrating process. Game Of Thrones works with a particular set of challenges, primary of which is reconciling the realities and worldviews of Westeros with those of the real world. This is a show set in a medieval time period, one that tells stories of a civilization that’s still trying to give feudalism a go. It’s a nasty system, and for every jewel-encrusted scene of courtly escapism, there are three or four illustrations of the human costs. As seen in “Breaker Of Chains,” the show can sell out the emotional heft of that cost for plot-based concerns, but it’s still smart enough to stage a scene like tonight’s dialogue about the Lannisters’ financial status. Nothing is secure in this world, not even the mining reserves that have given the lion his golden hide for generations. To witness the failure of the system that keeps such houses in power is satisfying to our modern sensibilities—almost as much as the cathartic destruction of Caster’s Keep. It’s a good match for an episode as laden with symbolism as this one is—in the words of the characters as well as their actions. When Jon Snow at last plunges his sword through Karl, it’s a callback to the deed Pod describes to Brienne by their campfire—a bit of heroism necessitated and accomplished because parties involved let their guard down. The Lannisters seek to insulate themselves from ruin and insurrection through marriage and fealty, shields that could be as effective as Meryn Trant’s armor, yet still fall victim to the grand plots and long cons of a patient schemer like Littlefinger. And as if last week’s visit from the White Walkers wasn’t enough to reinforce the fact that monsters still walk among our heroes, li’l Robin Arryn is back to remind us that no one is invulnerable to being wished out the moon door. Which is why I think it’s so important that “First Of His Name,” the pronoun in the title aside, puts so much focus on the show’s female protagonists and antagonists. “I will do what queens do,” Dany tells Ser Jorah before Emilia Clarke strikes an appropriately regal pose on the balcony. “I will rule.” But how she rules marks an important distinction, and a powerful rejoinder to some of the he-man women-hating Game Of Thrones has done in season five: It’s from a maternal sense of preservation and shelter. She feels a responsibility to the freed men and women whose cities she’s moved on from (her neglect of these territories containing shades of U.S. foreign policy from 2001 to the present), and it’s from a place of compassion that she seeks to act upon that responsibility. Notice that Dany has traded her riding gear for a more Olympian look this week. She means to offer protection from on high—not that that does anything to mitigate the growing god complex she’s acquired in the past two seasons. It’s a sort of herding impulse that’s taken to the extreme by Lysa Arryn’s child-rearing tactics: Keep those you love close by, and threaten to crush the hands of anyone who might wish to take them from you. Cersei hasn’t had the luxury of exercising such tactics: She’s seen the Iron Throne claim a husband and a son, and her only daughter is in the care of a house that seeks revenge against the Lannisters. (All claims of civilized, humane behavior from the Martells to the contrary.) For all this, however, there’s still a sense within “First Of His Name” that Cersei and Margaery control their own fates in King’s Landing. There’s such power in the way their conversation at Tommen’s coronation is presented: Elevated above the masses (like Dany in her Meereen stronghold), eyes locked straight ahead until a potentially wounding jab can be struck. They’re cooler customers than Lysa, who appears to spell her own doom when she gives Sansa that rundown of her life at the Eyrie. “First Of His Name” deftly raises the personal stakes for these characters while demonstrating that any blow they may wish to strike at this time might bring about even more problems. 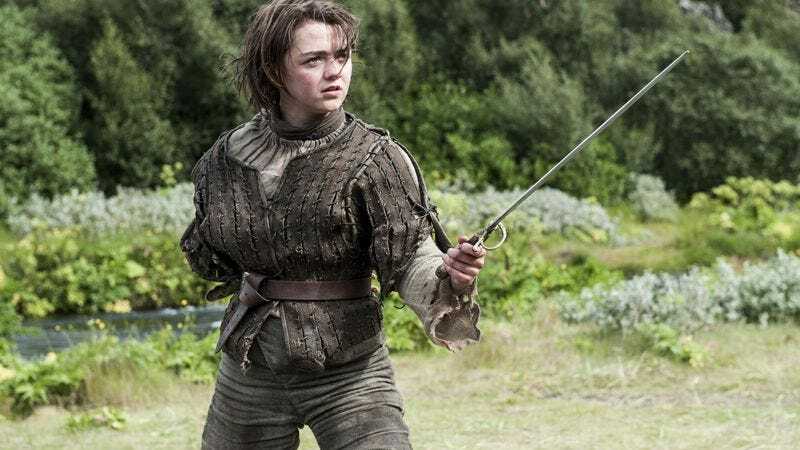 It’s an emphasis on parrying over thrusting that’s underlined in the expertly choreographed sequence of Arya’s sword-fighting practice. As Syrio Forel taught her so long ago, the Water Dance is a nuanced and elegant form of combat, so different from the hacking and slashing we see the Night’s Watch engage in at Craster’s Keep. The Hound may outmatch her in size and armor, but she manages to land Needle’s point on his abdomen nonetheless. Game Of Thrones would seem to favor the blunt, forceful, barbaric method of getting what you want, but “First Of His Name” reminds us that that’s not the only way. After all, if Littlefinger is to be believed, the most effective way to orchestrate the fall of a house or a king isn’t a full-scale war—it’s through secrets, lies, and poisons. Anyone who seizes power by more forceful means could very well find themselves alienated: Consider the horror that Bran instills in Hodor after the former takes control of the latter in the struggle with Locke. What needs to be done is done, but a trust is violated that might never be restored. Things are often taken by force in Westeros, but the blood on Hodor’s hands indicates that the show does not endorse or condone such methods. And when it depicts these methods, the show can still get them right from time to time. Game Of Thrones spin-off corner: Mr. Pod, in which Podrick’s horse discovers that the squire is smarter than he looks—he might not be able to ride, but he can speak, by golly!